If there is a mushroom that epitomizes the genus Inocybe--and why it is that the mushrooms in this genus are so unpopular among amateur (and professional) mushroom folks--it is Inocybe rimosa, also known as Inocybe fastigiata. It looks like literally dozens of other Inocybes--and even under the microscope it is confusingly indistinguishable. So there really is no point in listing the distinguishing features of the mushroom here at the top of the page, as I usually do. 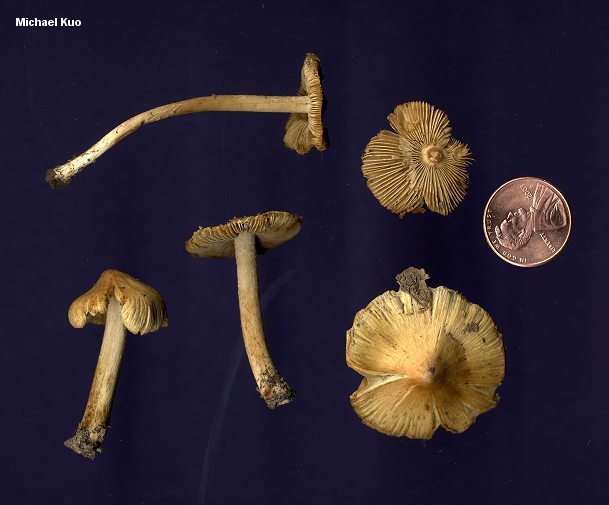 Compare your mushroom to the picture and, if it looks like a match, you are free to call it "Inocybe rimosa," though there are potentially hundreds of other possibilities, depending on how carefully you are studying the picture. Or take the other route: compare your mushroom carefully to the description below, with special reference to the microscopic characters. Ecology: Mycorrhizal with hardwoods or conifers; growing alone, scattered, or gregariously; summer and fall (and winter in California); widely distributed in North America. Cap: 2-8 cm; conical to bell-shaped, becoming broadly bell-shaped, usually with a sharp and distinct central bump; dry; silky or finely hairy; straw yellow to yellowish or yellowish brown; the margin splitting and the surface becoming radially separated. Gills: Attached to the stem but sometimes pulling away from it in age; close or crowded; whitish, becoming grayish and then brownish with maturity (sometimes developing a greenish cast). Stem: 3-9 cm long; up to 1 cm thick; more or less equal, without a swollen base; dry; smooth or finely silky; sometimes twisted or grooved; whitish or pale yellowish. Odor: Spermatic, mealy, or lacking (see below). 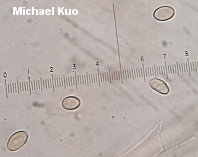 Microscopic Features: Spores 9.5-14.5 x 6-8.5 µ; elliptical; smooth. Pleurocystidia absent. Cheilocystidia 30-65 x 10-22; cylindrical to nearly clavate; thin-walled. REFERENCES: (Bulliard, 1789) Kummer, 1871. (Fries, 1821; Saccardo, 1887; Kauffman, 1918; Kauffman, 1924; Stuntz, 1978; Weber & Smith, 1985; Phillips, 1991/2005; Lincoff, 1992; Barron, 1999; Phillips, 2005; McNeil, 2006; Miller & Miller, 2006.) Herb. Kuo 07220309, BT 05140602. Inocybe curreyi, Inocybe fastigiata, Inocybe obsoleta, Inocybe pseudofastigiata, Inocybe schista, and Inocybe umbrinella are synonyms. The Index Fungorum lists 17 different taxon names for varieties and "forms" of Inocybe fastigiata, not all of which have been transferred (yet?) to varietal/form status subordinate to Inocybe rimosa. Additionally, a host of taxon names at the level of species may, or may not, be synonymous--including Inocybe sororia, Inocybe rimosoides, and Inocybe holoxantha (among many others). Minor differences in spore size, odor, cap color, and other characters account for more names than anyone but an inocybologist would care to sift through. Hey, That Mushroom Smells Like . . .
"Disagreeable" was the preferred word in the era of Kauffman, when Victorian sensibilities still prevailed. The word "spermatic" began to appear with more and more frequency, however, as the 20th Century progressed, and now it is hegemonic. That's all well and good, I suppose--but the present widely accepted use of the term spermatic may underscore the fact that mycology is still an Old Boys network--and still reveals a Victorian hesitation. Yeah, that one's going to have to be explained. The crux of my argument involves Russula xerampelina, the so-called "Shrimp Russula," which does not smell much like shrimp, to tell the truth, unless you are using "shrimp" as a synonym, a Victorian cover-up, for "vaginal." Why is it okay to call Inocybe rimosa spermatic, while heads would turn at a corresponding, genital-secretion-based description of Russula xerampelina? The answer is, because women mycologists are few and far between, and the Old Boys have not paused to imagine, for example, what must go through Inocybe expert Cathy Cripps's mind when she has to type "spermatic," or what a female graduate student in mycology must feel when she has to discuss the morphology of a species of Phallus with her male professor. If these good ole boys had to conjure up the olfactory memory of what is "vaginal" all the time, things might be different (then again, they might be worse). To be fair, since I brought up the parallel to Phallus, it should be pointed out that Amanita vaginata (as well as any mushroom that has a volva) forces male mycologists to address morphology with female genital terms--so maybe I should limit my argument to the odors. [O]dor very characteristic, not strong, but very penetrating, spermatic for an instant when the context is first exposed, but immediately becoming quite complex, predominantly a mixture of raphanoid and resinous with a trace of acetic acid, having a very decided pungency which quickly produces a tingling sensation in the back of the throat" (1950, p. 105). I hope to God I'm never forced to address this description when identifying an Inocybe, because I have trouble detecting the difference between, say, gasoline and lilacs. Throw in the fact that odors in Inocybe rimosa (the mushroom I'm supposed to be talking about) range from "none" to "mild" to "mealy" to "spermatic" to "strongly spermatic," depending on the author, and you begin to wonder whether there's a big, stinky, rotting mushroom in Denmark, and whether you might be better off moving somewhere else.